Everyone has doubt in some form or another in their life. I spend a lot of time doubting myself. My decisions, my actions and sometimes even my thoughts. It’s a hard habit to get out of, but this year I’m trying really hard not to let the doubt get the better of me. It’s holding me back in so many ways and I’m not going to let it any longer. I’m a pretty anxious person. Sorry for dropping the A bomb, but so many things in life make me incredibly anxious. I won’t go into it too much, but what I will say is that feeling doubtful and anxious about so many things is stopping me from reaching my full potential. Right now, i’m in a pretty good place in my life. I have a sturdy job, a roof over my head, good people around me and a strong, happy and healthy relationship. But even though I have all of those things, it doesn’t stop my brain from thinking up and going over 6528304 reasons why they’re all going to somehow fall away from me. I’m always trying to spread positivity, both here on my little corner of the internet and in my life in general, so maybe it’s time I started spreading it through myself as well! 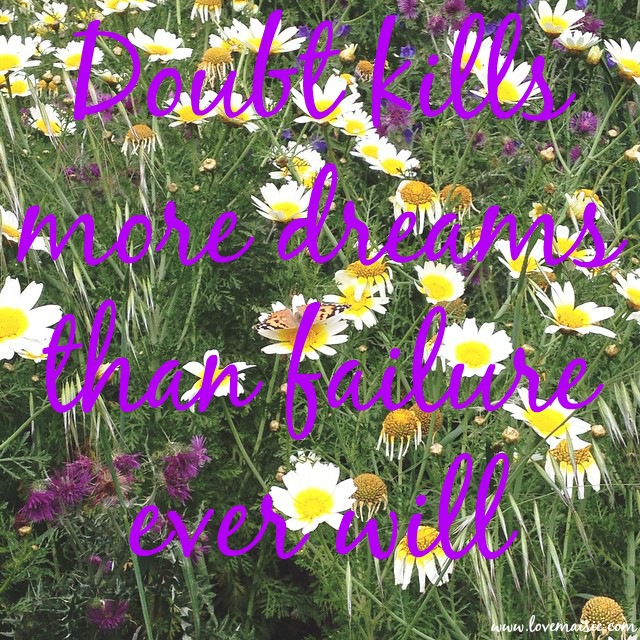 I really believe in this quote, doubt is holding so many people back from achieving all the things they want to accomplish today, tomorrow and in their whole lives. Let today be the day that you stop doubting yourself and start believing in yourself! Try it out, whatever it may be, if it doesn’t work out quite how you expected but it’s something you really want, then try again. Failure is a stepping stone, not a finish line. Love this! Really put a smile on my face. I too love spreading positivity and I always try to be as inspirational as I can. I love supporting and helping others in anyway I can. I do it less than I used to because unfortunately it has caused peopen to take advantage of it, which annoys me a bit. Anyway great post Maisie, I love reading your blogs. Aww thank you Lisa! What a wonderful comment!